The preferred shield of the Highland warrior was the targe. 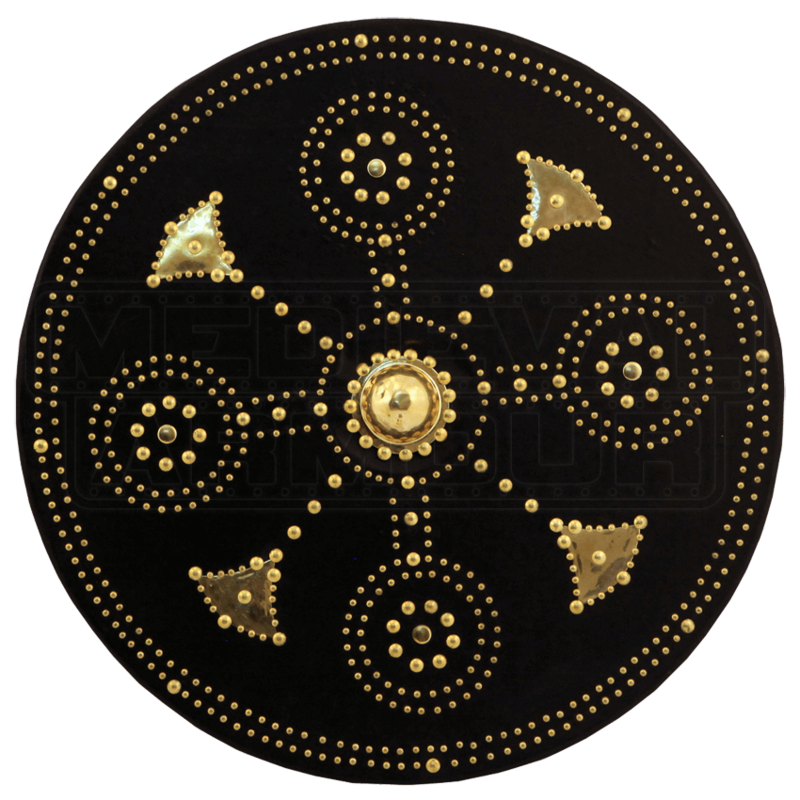 Slightly smaller than the typical medieval round shield, this Brass Studded Scottish Targe is a reproduction of the Scottish shield, in all its impressive detail and adorned glory. Targes were used successfully up until the Battle of Culloden, in 1746, at which point they were banned, and many were destroyed. This recreation reflects the look not of a typical soldiers targe, but instead, the targe of any number of important persons. The shield itself is made from wood, with a black leather covering on the front. In true reflection of the ornate Highland targes, this piece also possesses a rich level of decoration, including a fine brass boss at the center, ringed by brass studs and rivets all about its circular face. Concentric circles are among the most common shapes on this targe, which recreates one of the two more common patterns that were used in targe design. This targe is slightly larger than is traditional as well, measuring in at a 24 inch diameter. With its intricate and fine detail, this Brass Studded Scottish Targe is more of a decorative piece, one that will serve well as a cultural display piece in your collection, as well as a fine addition to any Highland attire that you might wear, too.